PHOTOS: The Supreme Court of Canada. 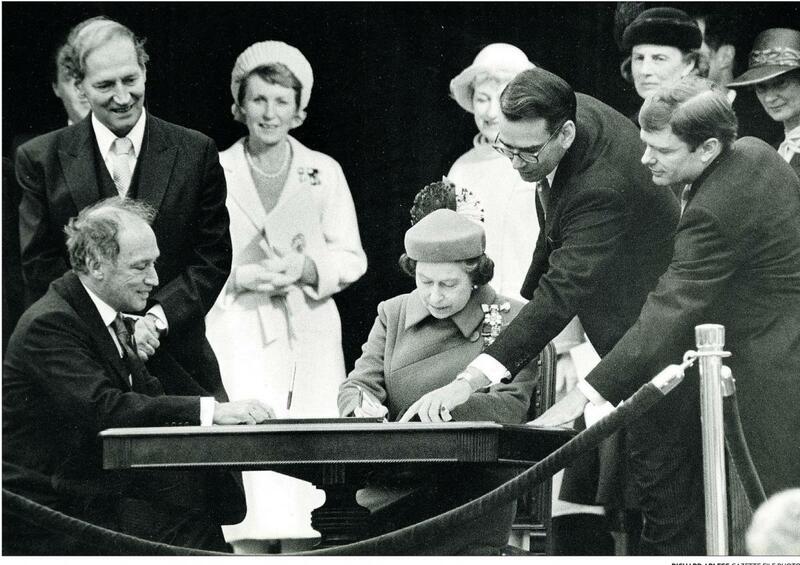 Below: Queen Elizabeth signs the Canadian Charter of Rights and Freedoms as Prime Minister Pierre Trudeau looks on smiling on April 17, 1982; the Charter. The Supreme Court of Canada’s ruling last Friday that Saskatchewan’s “essential services” law is unconstitutional because it interferes with the Charter-protected right of public sector workers to bargain collectively and strike if necessary spells big trouble for Alberta. Well, it doesn’t have to. There’s a sensible response Alberta could take. But given the history of public sector labour relations in this province, and the attitudes that drove it, that seems unlikely the Alberta Government will simply take the hint and rewrite the province’s public sector labour laws to comply with the country’s supreme law. No, “oil price trough” notwithstanding, Alberta’s Progressive Conservative Government is much more likely to hose away tens of thousands, possibly millions of dollars of tax money to go back to the Supreme Court to defend its own self-evidently unconstitutional public sector labour legislation. Back in 2007, the Supreme Court ruled that a British Columbia law tossing out a public service union’s contract violated the union’s right to bargain collectively. 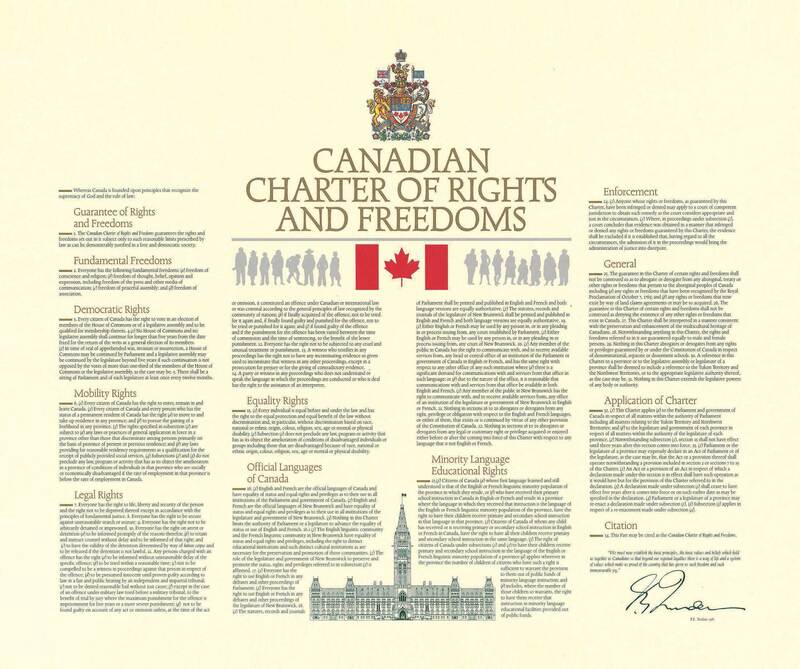 The ruling also explicitly extended the right to freedom of association guaranteed to citizens by the Canadian Charter of Rights and Freedoms to include the right to free collective bargaining by groups of workers. At the time, it was obvious this was a highly significant decision, but many legal scholars expected the court to roll back the sweeping nature of the ruling in later cases. This does not seem to be what has happened. And so on Friday, the Court ruled on several cases rolled into one that had challenged Saskatchewan’s “essential services” legislation. I have placed the words essential services in quotations because the intent of this law was obviously to interfere with the right of public sector workers to bargain collectively under the guise of protecting essential services. The province’s conservative Saskatchewan Party government introduced the law soon after it was elected in 2007. The law required employers and their employees’ union to agree which workers were essential and, if they couldn’t, let the government decide for them. In practice, the government could declare all workers in a worksite to be essential. The law was challenged by the Saskatchewan Union of Nurses, the Saskatchewan Federation of Labour and other labour groups, and thereafter made its way through the courts, with the Regina Court of Queen’s Bench ruling it unconstitutional in February 2012 and the Saskatchewan Court of Appeal reversing that decision in 2013. The Supreme Court has now spoken. It ruled Friday that the law is unconstitutional. Saskatchewan has a year to come up with a new version consistent with the Charter. Saskatchewan taxpayers will have to foot a considerable portion of the bills for the seven-year fight indulged in by their government. This, of course, is not the end of the matter. First of all, Nova Scotia, Newfoundland and British Columbia all have similar essential services laws to which this ruling may make effective challenges possible. And then there is Alberta. Here in wild rose country, we don’t even pretend to be in compliance with the Charter when it comes to public sector labour law. Well, in Alberta’s defence, its principal public sector labour law predates the Charter by five years. We don’t even pretend, as Saskatchewan did, that this is about essential services. So, for years, it’s essentially been completely illegal for all public employees to strike in any circumstances in Alberta. Period. Civil servants, health care workers, teachers – all the same. 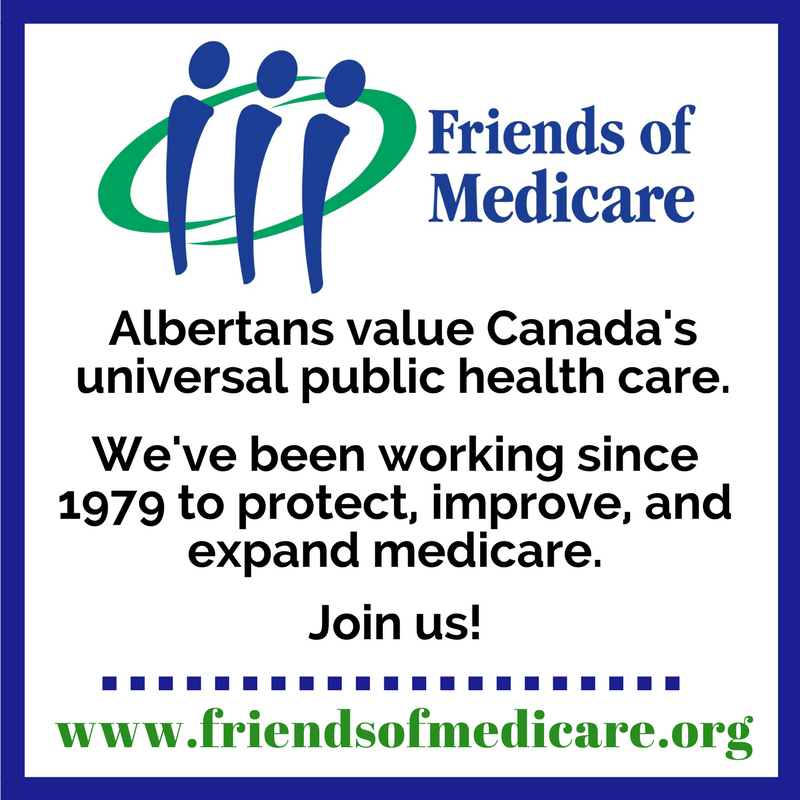 However, since the Peter Lougheed era in Alberta, this has been balanced by the use of binding arbitration, albeit with some highly unfair restrictions. OK, we won’t let you strike, the Lougheed Government in effect said, but if you can’t reach an agreement with your public sector employer, we’ll have an unbiased, disinterested arbitrator split the difference and issue a ruling everyone has to obey based on prevailing norms in the country and the job category. Certain things couldn’t be arbitrated by public employees – working conditions and pensions startlingly among them – but this still allowed a modicum of fairness on wages in return for losing the right to strike. With an arbitrator waiting in the wings, it was harder to argue convincingly there was no meaningful way employees could bargain collectively. Lately, though, that hasn’t worked very well for Alberta’s PC governments, in part because they wanted contracts no arbitrator would agree to. So in 2013, the Redford Government brought in the Bill 46, the Public Service Salary Restraint Act, which allowed it as the direct employer to impose whatever deal it felt like on the Alberta Union of Provincial Employees’ civil service members with no recourse to an arbitrator. That was so outrageous that an Alberta superior court granted the union an injunction suspending the implementation of the bill till the union’s appeal of its constitutionality was complete. 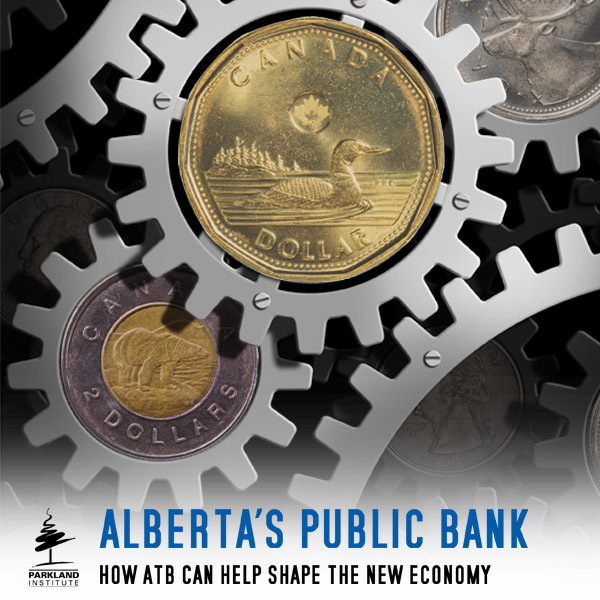 Without the hammer of Bill 46 hanging over AUPE, collective bargaining worked as it was supposed to, and the union bargained a deal – that would be the one the Prentice Government is now trying to wiggle out of with talk of 5 per cent rollbacks for everyone in the public sector. The Redford Government, however, also made it illegal for any Alberta even to talk about a strike by civil servants, in the odious and patently obviously unconstitutional Bill 45, the Public Sector Services Continuation Act, which violates every Albertans’ fundamental right to free speech. Bills 45 and 46 were both passed by the Conservative majority in the Legislature on Dec. 13, 2013. Bill 46 was rendered moot by the agreement with AUPE, but Bill 45 remains on the books. Of course, Bill 45 will die when it gets to court – and it’s being challenged now – although the Redford Government in a typically sleazy fashion passed it and had it and given Royal Assent, but never proclaimed, a technicality that means it’s not yet the law of the land (although it can be in about five minutes). This permits the government to try to argue it can’t be challenged in court because it’s not the law … yet. And if that sounds juvenile to you, I expect it will sound juvenile to the courts too. We shall see. This illustrates how far after 43 years in power Alberta’s PC governments think it’s reasonable to go to protect their own advantage in any kind of negotiation, and how little they care about basic fairness or the fundamental rights of Canadians. The Supreme Court of Canada is pretty clear, as it showed Friday, what it thinks about this kind of thing. Alas, since the way the law is structured in Alberta is just the tiniest bit different from Saskatchewan’s essential services legislation, I expect this will be the argument the Alberta government uses to try to wiggle of the hook set Friday by the Supreme Court. This could delay the day of reckoning if they try to do that, and it will certainly cost taxpayers a lot of money, but the Court has spoken forcefully enough it’s unlikely to make any difference in the end. 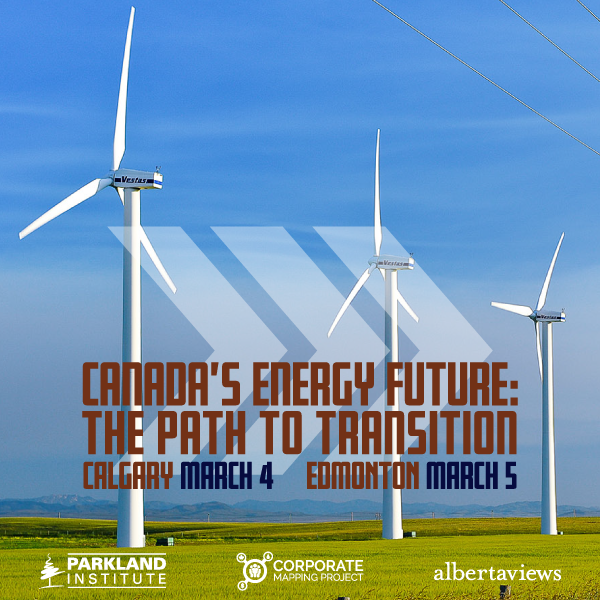 If the Prentice Government actually means what it says about the prudent use of your tax dollars in the face of an “oil price trough,” it will drop its appeals and get to work making Alberta’s labour laws comply with the Constitution of Canada. Alberta roundup: press conferences, photo ops, on-line surveys, not to mention a body in the back of a pickup truck! Bill 45 was the last gasp of freedom from a Progressive Socialist government. The only hope of taxpayers, individual workers, and freedom loving citizens. Let’s celebrate that it was introduced as a big victory for everyone except the union bosses. How about we legislate a Bill called “Jerome” that prevents you and your ilk from spewing out such nonsense? After all, it’s that kind of talk that reflects on all Albertans, by making us all look stupid. Perhaps, a case could be made for such a Bill in the name of National Security, since if our enemies get to thinking we are all as idiotic as you it could jeopardize our safety. I hope that the next time you receive medical care from a nurse, or the next time you have a teacher educate your children, you let them know that you think that they shouldn’t be allowed to have their contracts set by an impartial arbiter, but rather accept whatever you deem is appropriate for them to get paid. Because Freedom. Conversely, we could privatize health care and education, and you would end up paying a lot more for these services than they currently cost. Because Freedom. Leave it to a neo-liberal buttboy to argue that freedom means taking away freedom of speech. The road to serfdom, indeed. I think that it would be poetic justice for the public service unions to join collectively not only to tell Premier Prentice to shove his “blame the unions” approach to public finances up his rear but also to launch a court challenge to the blanket “no strike” provisions in labour laws such as PSERA and the Universities Act. Redford had the gall to try to make even compulsory arbitration meaningless by legislating that the government could ignore an arbitration that did not go their way. But compulsory arbitration is a travesty, in ay case, unless both parties want it. The right to strike as a last resort is a basic right for all workers and it would seem that the Supreme Court is gradually making clear that it recognizes this to be the case. Prentice, as he made clear today, is only concerned about the rights of the super-rich: he said that he could not consider increasing either royalties or corporate taxes. Who OWNS this puppet premier? Jimbo is like Mitt. There’s the cheap patter and then there’s the agenda. We’re so far down the rabbit hole the NDP could dust off the Lougheed platform and they’d die of fright lest someone think they’d take on such radical policies. Vandals, bandits, cowards, and stenographers. The four estates. Wall said he will try to recraft the legislation to conform with the court’s ruling, but he is ready with a backup plan. “If it looks like we cannot do that, then the only option we would have is to use the notwithstanding clause and simply say to the Supreme Court that we want to put public safety and welfare at the foremost, as our top priority for the people of Saskatchewan,” Wall said.